Heat oven to 400°F. In 9-inch glass pie plate, place pie crust as directed on box for One-Crust Filled Pie. Bake 8 to 10 minutes or until light golden brown. Sprinkle chicken and broccoli in partially baked crust. In medium bowl, beat eggs, half and half and salt with wire whisk until well blended. Pour into crust. 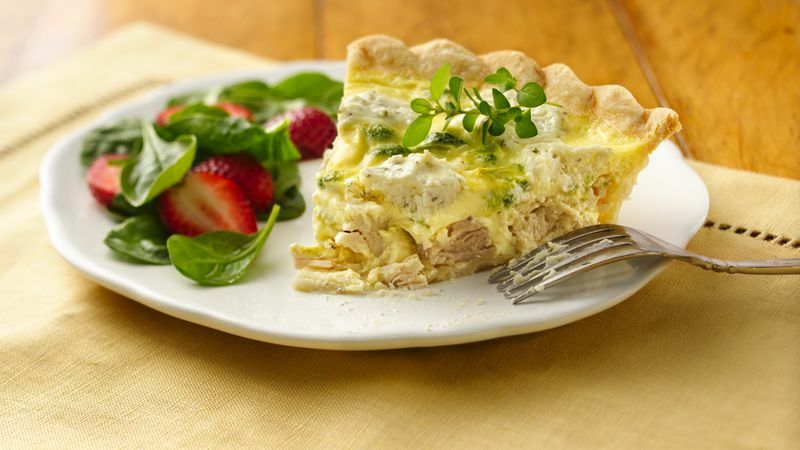 Drop cream cheese by teaspoonfuls into quiche. Cover crust edge with strips of foil to prevent excessive browning. Bake 10 minutes. Reduce oven temperature to 300°F. Bake 35 to 40 minutes or until knife inserted in center comes out clean. Remove foil; let stand 15 minutes before serving. This quiche is delicious cold, making it especially good for a picnic. Serve with colorful spiced apple rings.